"Never Let Me Go" was one film I was really looking forward to seeing. It is one of those films which I first hear about while it is in production and know nothing about it, yet I know who is in it and just that makes me want to see it. 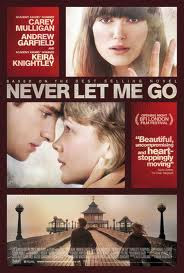 "Never Let Me Go" is the second pairing up in a feature film of Keira Knightley and Carey Muligan. I believe that these two are two of the finest British young actors going around at the moment. Firstly you have Knightley, who has proved that she can do it all. She can do the young roles, the damsel in distress, the tough girl, the object of affection and the historic roles. All of these she can do well, and has earned herself an Oscar nomination for "Pride & Prejudice" in doing so. At the present time she is also appearing in "The Children's Hour" in London's West End. There is nothing she can't do. Then you have Carey Mulligan. Mulligan has completed the majority of her work in British television, but 2009 and 2010 were big years for her in regards to film. Her break through role was as Jenny in "An Education" in which she recieved wide acclaim and her first Oscar nomination. As much as I admire and love Mulligan's performances, I would love to see her in a role which would require her to smile a bit more! Maybe a romantic comedy should be on the cards for her to break up her intense dramatic roles and show that beautiful smile of hers. Don't get me wrong, I don't want her to turn into an actor who only does the cutesy rom-com roles, but she has such a beautiful smile, it would be great for her to show it off on screen once or twice and lower the intensity. However, she does intense extremely well.With these two involved, "Never Let Me Go" looked like a winner to me, even when I didn't know what it was about. We are all guilty of this, but what is a better marketing tool than your favourite actor or actors? "Never Let Me Go" is the new film from Mark Romanek based on the best-selling novel of the same name by Kazuo Ishiguro. It is an interesting and unsettling film, but also very tender and emotional. It has been described as a film about love and betrayal, which it indeed true, but it is also about growing up and the emotions which make us human. "Never Let Me Go" centres around three school friends, Kathy (Carey Mulligan), Tommy (Andrew Garfield) and Ruth (Keira Knightley). The film opens in Hailsham, a strict, but pleasant boarding school when the friends are young. Their friendship and dynamics with one another change as they get older and they come to experience emotions and feelings between one another that one would not suspect at such a young age. All this because Hailsham was not as it seemed and they were not normal children. "Never Let Me Go" is not what it is made out to be. Perhaps this is a good thing as it makes the film more intriguing and interesting, but it is not a good thing if you are expecting a movie truly about love. There is a great deal of emotion in this film, the large majority of it being hard emotion. You feel so much sorrow for these three characters and what they have to go through day by day. It actually puts your life into greater perspective by making you realise the freedom you have to do what you want to do and be who you want to be. "Never Let Me Go" is largely a character based drama, focusing primarily on who these three main characters are and how they feel as a result of the walls which are put up around them. Although the audience does not see anything which would make them cringe in pain, they do feel pain just from the thought of what these three friends have to go through. It is a credit to the film makers that they can create stir up so many feelings and make so much of an impact by something which they cannot see. The film is beautifully directed and the cinematography is quite superb. Romanek captures the tranquility and serenity of the English boarding house extremely well. The scene at the beach is also a standout in his direction. "Never Let Me Go" has a great story and is brilliantly written and cast. Carey Mulligan gives another superb performance as Kathy H. She is able to tell the audience so much just from the look in her eyes. Her performance reaches its peak towards the end of the film. Honourable mention should also be given to Isobel Meikle-Small, who plays the younger Kathy H and looks uncannily like a younger version of Mulligan. Throughout the film, it can seem as though Andrew Garfield has drawn the shortest straw, as he has perhaps the easiest role throughout, but then in one particular scene towards the end of the film he completely blows everyone else in the film out of the water. His performance brings tears to your eyes in this particular scene, and it shouldn't be a question of which scene this is after you see it. It is so good to see Garfield complete a role which is completely different from his role in "The Social Network" as it proves that he has a long and bright future ahead of him, and not just as the next Spiderman. However, on screen Mulligan and Garfield do not have a great amount of chemistry. They do not seem quite as in love as the story makes them out to be. Keira Knightley also gives a great performance in which she goes through all the emtions one would in such a situation with complete believability. The interaction between Knightley and Mulligan on screen works superbly as they both know who their characters are and the tension is felt between these two, but also the love is felt between them too. "Never Let Me Go" is an emotional film. There is nothing presented on screen which would make this visually a hard film to watch, but the thought processes it sets you on and the way it makes you feel are not easy things to face. This does make for a splendid work of art as it makes you feel and think things that you wouldn't have unless you had seen this film. I think I've said this a few times around the interwebs, but NEVERE LET ME GO has to be one of the most underrated films of the year. I was deeply moved by its story, and actually a little saddened that I had decided to read the book first. All three leads give stellar showings, and Mark Romanek's direction is so elegant it makes me wish he'd get behind the camera more often. Great post - really glad to hear that you enjoyed this one. ehhh I have to disagree with you on this one. We actually watched this on Saturday night and had a long discussion about it afterward. They focused so much on the love story in this film and completely ignored the ethical issues of the entire plot! and I kind of thought the acting was a bit blah.